Nevertheless, Ratcliff had a string of letters and lectures published in The Lancet of his day. Eadie MJ. Rigor mortis and the epileptology of Charles Bland Radcliffe (1822-1889). J Clin Neurosci. 2007 Mar;14(3):201-7. At times, he appeared to cheerfully make assumptions that enabled him to complete gaps in his chain of evidence. He seemed incapable of seeing defects in some parts of his grand corpus of ideas, defects that would call into question the validity of their whole, and he failed to modify his intellectual position as the mounting tide of evidence ran contrary to his concepts. As a result, if his thought is now remembered at all, he is recalled as a man who got many things quite wrong and who produced lines of thought that, despite all that he wrote, for the greater part led nowhere. Fig. 2. A sample plate (Probetafel) from Flatau’s Atlas of the Human Brain by Karger, Berlin, left, depicting the ventral cerebral facies (author’s archive). 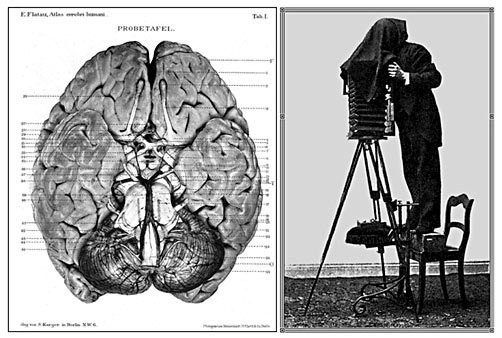 Flatau demonstrating his method for macroscopically photographing fresh human brains, right; from a technical article traced from a citation by Pollack (courtesy: Universitätsbibliothek Hamburg). Dr. Flatau hereby offers physicians and students an atlas of the human brain, which depicts the various full views and some of the most important brain sections in eight plates (11 figures). These plates – from photographs of fresh brain – give an almost three-dimensional impression of the cerebral facies, in clear and characteristic sections, overall deserving to be designated as a superb teaching aid, suitable as a totally reliable reference for both self-study, in the case of not having access to fresh material, and for comparisons at autopsy and the like. A leading ‘schematic plate’ in this atlas attempts to give an overview of our knowledge on the course of fiber pathways in the central nervous system in 13 multi-colored drawings, incorporating the known accounts of Mendel, Bekhterev and Edinger on this theme, and continuing with the opposing views of Golgi and Ramón [y Cajal] on the structure of the nervous tissue. The 27 text pages are devoted to the explanation of these schematic drawings. The price of the work (12 marks) is minimal if one considers its breadth and beauty. Author and publisher deserve the appreciation of the medical community for this valuable work. It’s unlikely that brain scans can tell us who makes a good chief executive, but here’s the BBC on the brains of British businessmen.